JEPIC has been conducting bilateral seminar programs with electric utilities in ASEAN countries with strong support from electric power companies in Japan. The purpose of the program is to strengthen the business infrastructure of the electric utilities in ASEAN countries, such as basic and expertise technologies, management and human resources development. JEPIC and Ministry of Electricity and Energy (“MOEE”;MOEP and MOE was formed together into MOEE on April,2016) launched their bilateral cooperation programs in 2005. 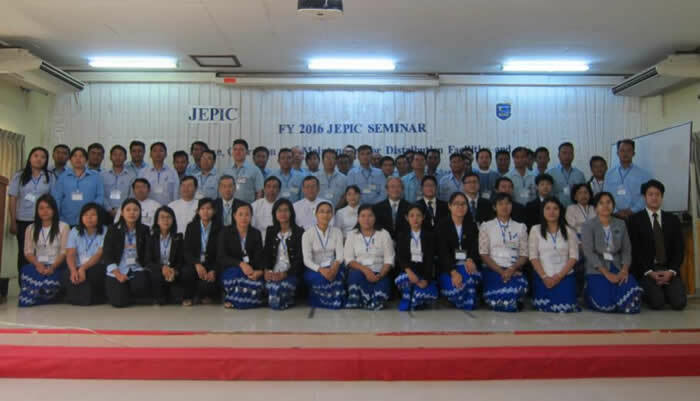 Since the initiation, JEPIC and MOEE have held seminars every year in Japan as well as in Myanmar. 2 experts from Chubu Electric Power Co., Inc.
50 MOEE participants attended the Seminar. After the presentation, we had a fruitful discussion and shared opinions as to Design, Operation and Maintenance for Distribution Facilities and Distribution System.